This week, we continue our Twins rotation preview by taking a look at Hector Santiago. Acquired from the Angels midseason last year, he figures to be a fixture in the Twins rotation for the 2017 season. It’s a good week to brush up on your Santiago knowledge, because you’ll probably be able to see him pitch in a meaningful game within the next couple of days! He’s on the Puerto Rican roster for the World Baseball Classic, and they’re playing three games in a row: they face Venezuela today, Mexico tomorrow, and Italy on Sunday. A quick aside: if you haven’t been watching the World Baseball Classic, you really should start. It’s a chance to watch competitive baseball for the first time since early November, but it’s also different and exciting. The stadiums are different, the uniforms are different, the format is different, and many of the players are different. Some teams are stacked with major league talent (like the Dominican Republic and the U.S.) Others display high level talent from leagues in their own country (such as Japan and Cuba). Some have little or no top-level talent to speak of, and are all the more fun for it (like Israel, who swept their first round of pool play). It finishes with a single-elimination tournament, which promises lots of exciting, hotly contested games. Want to relive the Twins’ glory days of the early 2000s? Tune into a Puerto Rico game, and you may be treated to a J.C. Romero sighting. And most importantly, after reading this guide, you can use your newfound knowledge to impress your family and friends. Let’s get started. Santiago throws five pitches: a sinker, a cut fastball, a changeup, a slider, and a curveball. He relies heavily on his sinker, which he throws 70% of the time to left-handed hitters and 63% of the time to right-handers. To righties, he throws his changeup 25% of the time and the other pitches less than 5% of the time each. To lefties, he mixes his changeup, cutter, and slider about evenly around 9% of the time each, throwing a curveball on around 4% of pitches. When does he throw it? Santiago has a PCPS of 0.052, making him the first pitcher in our series to be on the lower end of the PCPS spectrum. This means that his offspeed percentage is pretty consistent, no matter the count. In other words, the count gives a hitter relatively less information about what pitch is coming than it would for the average pitcher. The graphic below, grabbed from our PCPS Viewer, backs this up. Most of Santiago’s consistency in his mix of pitches stems from the fact that he never throws much offspeed to begin with. In every count, he threw sinkers more often than not. While he’s slightly more likely to throw offspeed in pitcher’s counts than in hitter’s counts, this pattern is dwarfed by his overwhelming tendency to just keep pounding sinkers. If you’re hitting against Santiago, in other words, PCPS says it’s probably not worth looking for pitch-mix patterns by count. Just be ready for lots of sinkers. In fact, there aren’t many patterns to speak of in Santiago’s approach. His mixing is pretty even. But he does have one interesting quirk, and to explore it, we need to look at pitch sequencing. Pitch sequencing—how a pitcher plays his pitches off each other to set up the hitter—is hard to analyze. 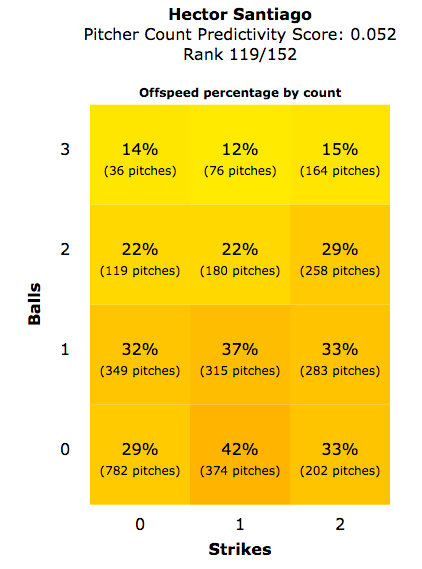 Each at-bat is unique, the the interplay between pitches depends on so many factors: what type of pitch was thrown, where it was located, whether it was a ball or a strike, whether the hitter swung, for a few. Nonetheless, I used a simple approach to analyzing Santiago’s sequencing, which hinted at an interesting tendency. The most striking takeaway is that Santiago threw consecutive changeups to the same batter much more often than would be expected: 190 times, versus an expected 106 times. 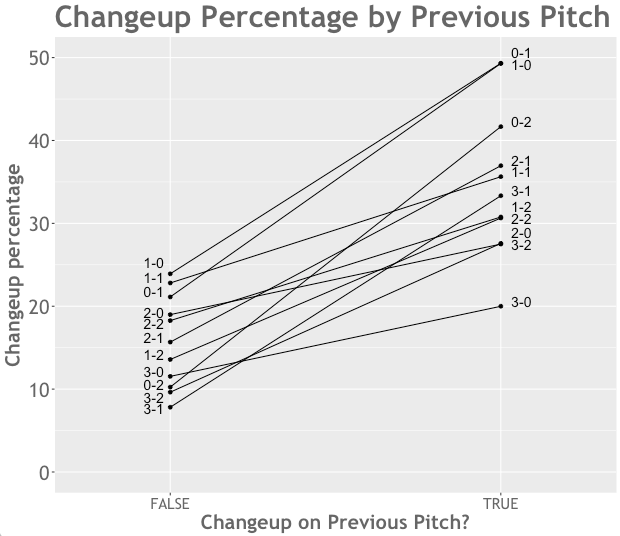 If you’re a batter facing Santiago and you just saw a changeup, you’re much more likely to see another changeup. Interestingly, this is true in every count (save 0-0). 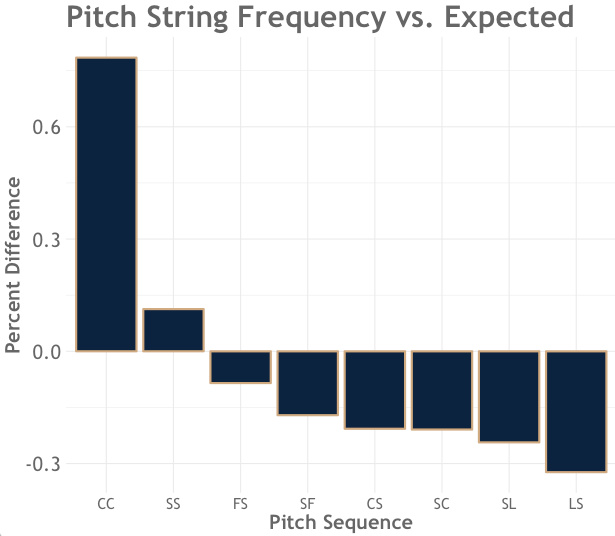 The chart below shows Santiago’s changeup frequency based on whether the previous pitch was a changeup. Each line denotes a different count. The chart uses data from all hitters, but this pattern also holds when looking only at right-handed batters (who tend to see more changeups). According to PCPS, Hector Santiago is a relatively good pitch mixer; different counts don’t provide hitters much information as to what pitch is coming. There also aren’t many other patterns in his approach for hitters to latch onto (other than a predisposition to follow changeups with changeups.) Santiago doesn’t have overwhelming stuff, so his even mixing helps him keep hitters on their toes and get them out. Code for this article can be found at my Github page.